Sometimes when I make cupcakes, I feel the urge to try and combine as many flavors as possible just to see how things turn out. Last weekend, during my baking extravaganza, I had a batch of leftover brownies and no one to eat them. In an attempt to avoid eating them all myself, I decided I wanted to put them inside a cupcake. 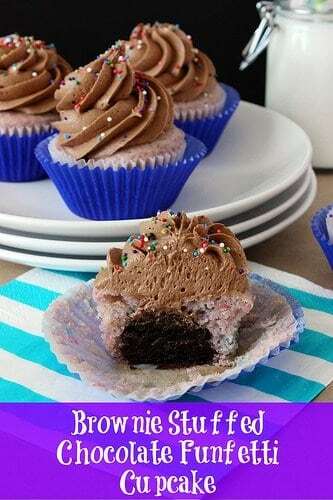 Yes, a brownie stuff cupcake. For the cupcake, I used my favorite funfetti recipe from yourcupofcake.com. For the frosting, I wanted to see if I could make a chocolate funfetti frosting. 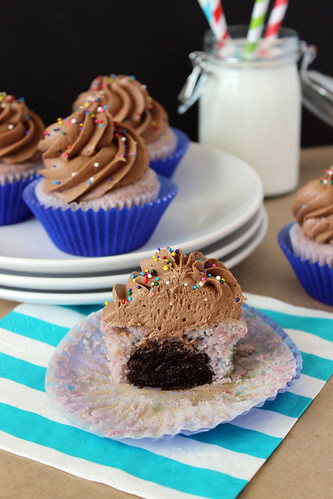 I mean, who wouldn’t want to combine the best two cupcake flavors ever, right?! Bake a boxed mix of brownies according the package instructions. Cool completely. When ready, use your hands to crumble brownies into pieces and measure out 3 cups into a separate bowl. 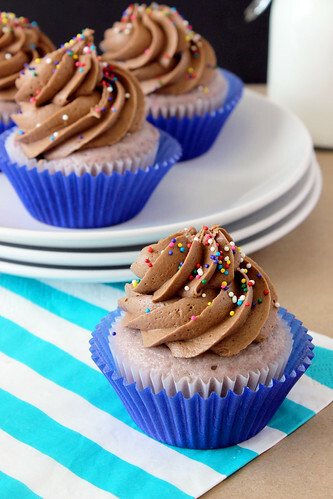 Combine with ½ cup of chocolate frosting. Use your hands to mix everything together into one large ball, ensuring the frosting is well mixed. Roll 24 balls of the brownie mixture, about 1 tbsp in size. Set 1 brownie ball in each cupcake liner. Combine egg whites, oil, buttermilk, sour cream and vanilla extract in a bowl and whisk gently. Slowly mix in cake mix until well combined. Add sprinkles and gently fold into batter. Fill lined cupcake pan 2/3 full, tap the pan a couple times to evenly coat the brownie. Bake for 12 minutes, check with a toothpick and bake another 2-3 minutes until tops are golden or until you can insert a toothpick and it comes out clean. Let cupcakes cool for 5 minutes before transferring to a wire rack to cool. Having a brownie stuffed inside the cupcake was pretty dang amazing, but what impressed me the most about these cupcakes was the frosting. I whipped the heck out of this frosting and used heavy cream instead of milk to make it super light and fluffy. 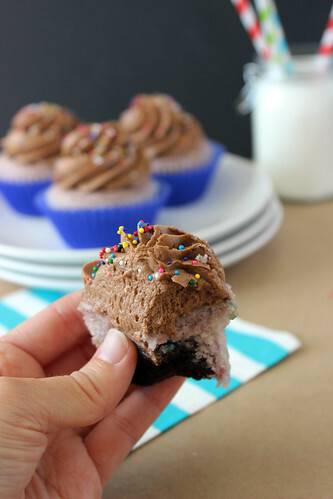 There’s actually cake mix in the frosting and cocoa powder to create a chocolate funfetti frosting. Allow butter and cream cheese to come to room temperature. Use a fine sifter to sift the cocoa powder, eliminating any clumps. Once softened, combine butter and cream cheese in a large mixing bowl and beat on medium speed until smooth and creamy. Slowly add cocoa powder and continue to beat on medium speed until smooth. Add 2 tsp vanilla extract. I like to add the vanilla extract after the cocoa powder to help keep the mixture smooth. Add 1 cup vanilla cake mix and continue to beat on medium speed; add the other 2 tsp vanilla extract. Continue to slowly add confectionary sugar followed by the heavy cream. Beat for several minutes with the paddle attachment on medium-high speed. Switch to the whisk attachment and beat for another 3-5 minutes until frosting is light and fluffy. 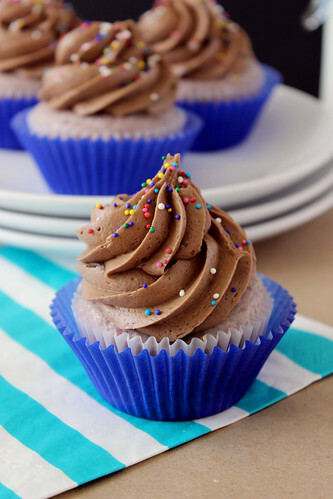 I think you will be pleasantly surprised at the airiness of the frosting after beating it for so long! I feel as though the longer I whip the frosting, the better it becomes. I choose not to put sprinkles into the frosting because I liked the look of the sprinkles on top. This post is linked up on the Back for Seconds blog.